Give your hair the TLC it needs by using products that offer customized solutions. Do: Massage your scalp with coconut or Jojoba oil. Do this at least once a week before you sleep or two to three hours before you wash your hair. Wash your scalp every other day with an anti-dandruff shampoo and condition your hair daily. Don't: Avoid scratching your scalp! Instead, massage it gently using your fingertips. Visible flakes are a result of altered skin barriers which trigger skin cells to grow at a rapid rate. It's all about keeping your scalp protected, clean, and moisturized. Do: Brush your hair gently every night. Wash, cleanse, and lock in moisture by evenly using a hydrating conditioner. Don't forget to massage your scalp to help bring out its natural oils. Don't: Avoid over-washing and constant styling with hot tools. Also, stay away from coloring your hair too often, as the dyes can dry out your strands. Do: Hair supplements, hot oils, and leave-on treatments help provide your hair with the nourishment it needs in increasing your hair's elasticity and improving its shine. Condition daily and have your hair trimmed regularly to keep split ends at bay. Don't: Avoid the heat! Wear stylish caps or hats to protect your locks from the sun. Naturally, you also want to avoid using hair straighteners or hair irons as the high temperatures can damage your hair even more. Do: Follow a balanced diet to provide your hair and scalp the vitamins (eg. iron, protein, and vitamin C) and essential fats it needs to keep it healthy. Wash your hair every second or third day with anti-hair fall shampoos. Don't forget to condition daily, too. Don't: Be sure to skip on the tight ponytails and elastic bands as these will pull your hair back causing it to fall. Opt for loose braids or a hair band if you need to keep your hair out of your face. PS: It's normal to have to lose at least 50-100 hair strands per day so don't stress too much about it (unless you're seeing more than you should!). ICYDK, stress is considered a factor to hair loss. Do: Use only quality dye products and deep condition your hair once a week with color-safe products or one that goes along with your hair dye kit to make your colors appear more vibrant and long-lasting. As much as possible, shampoo your hair only when you really need to. Make sure to use color protecting shampoos and conditioners. Don't: Avoid using warm water and products that contain sulfates and chlorine. Having these on your tresses is a shortcut to watching beautiful color run down the drain as you wash your hair. But with every hair problem, the ultimate solution is to use a conditioner that's customized to target specific hair needs. After all, long-lasting hair health depends on well-conditioned hair and keeping moisture locked in as much as possible. This is why conditioners are non-negotiables when it comes to any type of haircare routine. With conditioners that offer customized solutions like Cream Silk, keeping up with a routine becomes easier and achieving tresses worth being called our crowning glory is just a wash away. 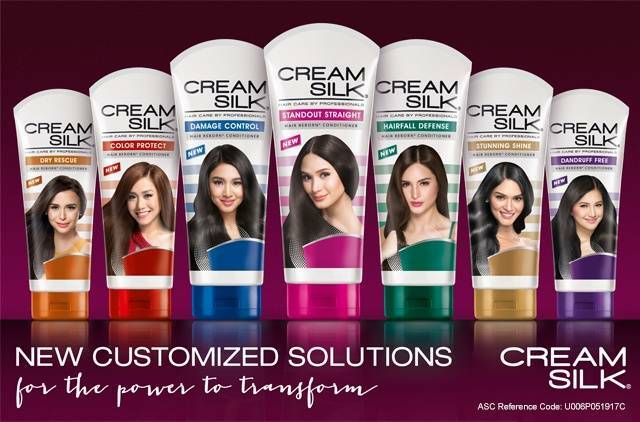 All new Cream Silk with 7 Customized Solutions has Advanced Hair Reborn Technology to target specific concerns for different hair types. Know the Cream Silk Customized Solution for you by answering the Cream Silk Hair Profiler here.